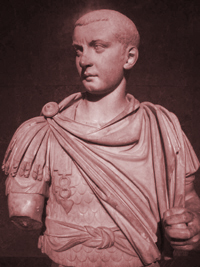 Gordian was born into a family of wealth and power as he was the grandson of the well-to-do Gordian I and the nephew of Gordian II, both who were proclaimed and served very short tenures as empror after an uprising in Africa against the emperor Maximinus. He was also born into a time of upheaval, revolts, and conflict not only from the enemies of Rome, but also between factions within Rome. His uncle died in battle in Carthage against Capelianus, the governor of Nubia, who was a personal enemy to the elder Gordian and whom marched in support of Maximinus. His grandfather committed suicide thus ending the Gordians extremely brief stints as emperor. Two senators, Pupianus and Balbinus, took the throne and took to the task of removing Maximinus who was on his way to Rome after hearing that the senate had declared him a public enemy. For political reasons they proclaimed the 13 year old Gordian as Caesar and imperial heir. Maximinus was killed by his own troops and soon conflicts began to rise between many different factions which climaxed with the death of the two emperors at the hands of the praetorian guards and them in turn proclaiming Gordian III sole emperor still in his teens. It is most likely that Gordian was guided in his reign by ministers who, on the whole, did a competent job with Gordian III serving as mostly a figurehead. The reign of the teenager was relatively devoid of those problems that so commonly arose in the reigns of very young rulers. His reign was marked by a continued push to secure the borders of the empire and repair internal strife, an uprising, and most importantly hostilities with a renewed and expanding Persian Empire. After some successes the Roman forces suffered a defeat in modern day Iraq and Gordian lost his life. According to whom you believe, Gordian III either died in this battle, died by the treachery of his successor Phillip the Arab, or simply died of an illness. He died at the age of 19 having served as emperor for 6 years. Young Gordian's rule seemed to bring a brief moment of calm to the empire's ever growing chaotic instability.